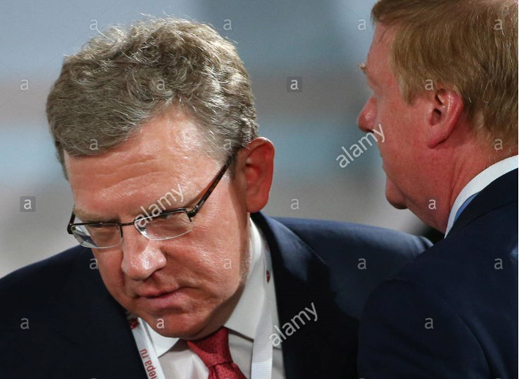 Clifford Gaddy (lead image, left) has never recovered from his 20-year infatuation with Anatoly Chubais and Alexei Kudrin. 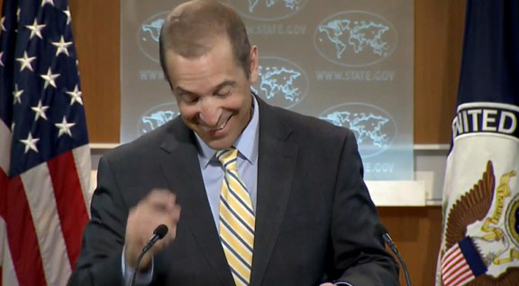 Neither has Gaddy’s boss at Brookings Institution in Washington, Strobe Talbott (right), the regime changer-in-chief at the State Department in the 1990s, when Boris Yeltsin was his man in the Kremlin, and the rest of the country too weak to resist. If only they ruled Russia today, President Chubais, Prime Minister Kudrin or vice versa, instead of President Vladimir Putin, there could never ever be the Kremlin plot Gaddy and Brookings charged last week for blackmailing United States officials and their allies with something like the Panama Papers. A regime-changing plot like that isn’t as preposterous as it sounds — not because Putin thought of it, as Gaddy now claims, but because Gaddy and Talbott used it a good many times themselves in Moscow, and in Belgrade too, until Putin put a stop to them. For lossmaking Brookings, however, putting a stop to Putin’s plotting is a desperate advertisement for badly needed funds. “Are the Russians actually behind the Panama Papers?” is the title of Gaddy’s indictment. It isn’t an opinion-page piece placed in a newspaper. There’s no institutional disclaimer either. It is an official publication of the Brookings think-tank where Gaddy is chief expert on Russia, and Talbott is chief executive. Gaddy provides no evidence. Instead, he proposes the ancient Roman courtroom trick of casting blame in the direction of motive when the evidence of commission of acts is absent. “The cui bono [“to whose good”] principle connects profits with motives, asking who stands to gain from a certain action. If it’s the Russians who win, isn’t it possible that they are somehow behind at least part of this story?” — that’s another of Gaddy’s trick questions, to which he has the ready answer. 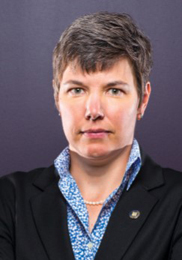 RosFinMonitoring’s chief, Yury Chikhanchin, who has an economics doctorate like Gaddy and 16 years in the security services, first took charge of the agency in 2008. 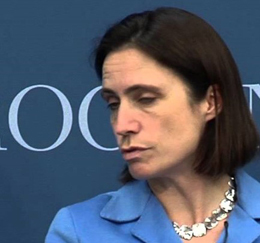 Four years later, in June 2012, Putin met him publicly, twice, to hand him the cover story, according to Gaddy, for what RFM really does that’s different from its US counterpart, the US Treasury’s Financial Crimes Enforcement Network (FinCEN), headed by Jennifer Shasky Calvery (right). Putin and Chikhanchin, June 13, 2012. According to Brookings, Putin told Chikhanchin to break into Panamanian offshore company registration files to find the names of influential US government officials and businessmen in order to blackmail them into taking Kremlin orders. In July 2013 the RFM was exposed in public as Putin’s personal spy agency. That was in a publication financed by the Russian state media budget. The author of the disclosure was… Gaddy. One of the secrets Gaddy kept then, and now, is that between 2000 and 2002 Chikhanchin was head of the Currency Control Department at the Finance Ministry. The minister to whom he reported was… Kudrin. When Cicero called out “cui bono”, the Romans in court didn’t know what a boomerang was. Without evidence, the Putin plot according to Gaddy is just that. He invites the question – what motive, benefit, or profit can he, Talbott, and Brookings have for attacking the Panama Papers as a Putin blackmail scheme? This isn’t a trick question. According to Gaddy’s resume, in the mid-1990s he was “an advisor to the Russian finance ministry and regional governments on issues of fiscal federalism for the U.S. Government’s Tax Reform Oversight Project for Russia.” Talbott was Under-Secretary of State. The recent release of the transcripts of telephone-calls and meetings at the time between President Bill Clinton and British Prime Minister Tony Blair reveals that Talbott’s mandate was to keep Yeltsin in power if possible – and if impossible, build up as his replacement Yegor Gaidar at best, Victor Chernomyrdin at worst. Getting rid of Prime Minister Yevgeny Primakov was one of Talbott’s regime changes; at the same time as he was plotting the overthrow of Slobodan Milosevic in Serbia. For details, read this. The second alternate expert on Russia on the Brookings payroll, titled “senior fellow in the Project on International Order and Strategy in the Foreign Policy program”, is Robert Kagan. He is the husband of Victoria Nuland, who is in charge of regime-change operations for Russia and Ukraine at the State Department at the moment. For details, click to read. For the money in the pay packets of Talbott, Gaddy, Hill and Kagan, open page 39 of the 2015 annual report for the current list of Brookings paymasters. The foreign governments giving this cash include the US military allies, Australia (foreign ministry, defence ministry), Canada, UK, Japan, South Korea, Qatar, Turkey, United Arab Emirates (UAE), and Norway. To match these countries and governments to the list of names revealed in the Panama Papers, open this. Of the governments appearing on both the Brookings and Panama lists, either directly or through proxies, the most obvious are Qatar, Ukraine, UK, and UAE. But their wars may be hurting Brookings’ bottom-line. 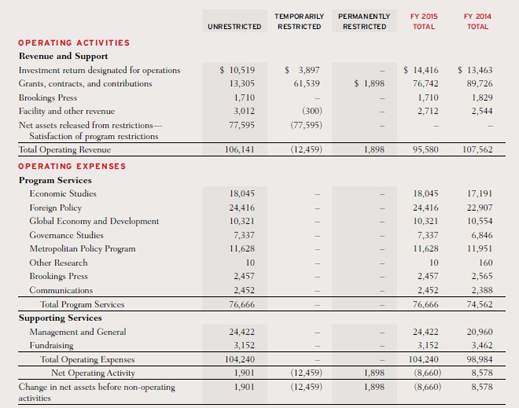 The think-tank reports its revenue in 2015 fell from the year before by 11% to $95.6 million, while its operating costs jumped 5% to $104.2 million. Brookings’ investment income also suffered, dropping from a positive $38.9 million in 2014 to a negative $22 million in 2015. This means the think-tank is in the red operationally, and needs to raise more donor cash urgently. Source: http://www.brookings.edu/~/media/About/Content/annualreport/2015annualreport.pdf -- page 42. The need for fresh money is particularly urgent for foreign policy, because Talbott, Gaddy, Hill, Pifer, and Kagan aren’t cheap: they consume one-third of the think-tank budget each year. Foreign enemies, not domestic American issues, are what brings home the bacon for Brookings. Brookings’ committee for offshore money-raising is headed by Antoine van Agtmael, an American of Dutch origin. His business is emerging market investment funds; they appear to be based in the UK, and use Ireland for offshore registration; Russia has not been one of his investment targets. The Brookings board is heavy on Americans (3), Spaniards (3), Mexicans (2), Canadians (2), and Israelis (2). The Panama Papers list of names counts five Israeli oligarchs — Lev Leviev, Idnan Ofer, Teddy Sagi, Dan Gertler, and Beny Steinmetz. There are several Spaniards, including the Spanish duchess, Pilar de Borbon, sister of former King Juan Carlos. There are no Russian donors to Brookings — only anti-Russian donors. The flushest of them is the Ukrainian oligarch, Victor Pinchuk. He has been providing $200,000 annually to the institution, and he takes a seat on its International Advisory Council. He funds the pro-Kiev, anti-Moscow Ukrainian coverage by former US Ambassador to Ukraine, Steven Pifer, a salaried Brookings Fellow. For more details, including Brookings’ and Pifer’s refusal to discuss the Pinchuk money, read this. The latest report from Brookings on where its money came from in 2015 identifies Pinchuk as continuing to give in the range of $100,000-$249,000. 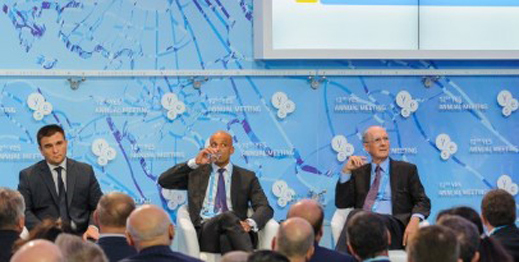 Talbott (right) was Pinchuk’s guest at the Yalta European Strategy (YES) meeting in Kiev on September 12, 2015. On the left, Ukrainian foreign minister Pavlo Klimkin; centre, James Appathurai, the Canadian spokesman for NATO. Pifer of Brookings has been a regular guest of Pinchuk’s at the annual YES convention for years. Following the Brookings money trail identifies a cui bono motive for Brookings to protect its benefactors, local and foreign, by attacking the Panama Papers in case the money landing in the Brookings till has been laundered from benefactor crimes. The Russian charges that Pinchuk stole more than $200 million from his Rossiya Insurance Company in Moscow suggest something of the sort, though there have been no trials, no convictions. For details of that case, read this. 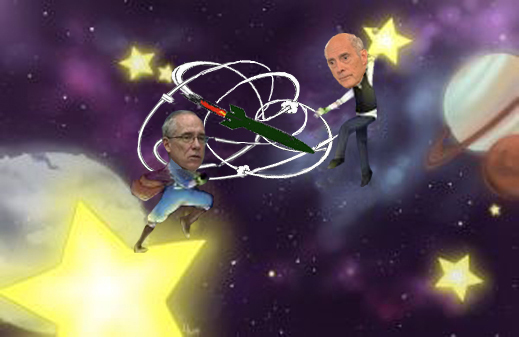 Brookings almost follows the money trail into the ICIJ, but stops short. Had it gone further, it would have discovered among the financiers of ICIJ and its Washington parent, the Center for Public Integrity (CPI), there are George Soros’s Open Society Foundations; many of the same American foundations to be found on the Brookings benefactor list; plus proprietors of the media which are publishing the Panama Papers. This cui bono trail runs around the world in a circle. For example, Soros pays money to the ICIJ to receive the Panama Papers, and pays the Mail& Guardian of South Africa to report them. The US Agency for International Development (USAID) also pays into the circle by financing “fact checking”, “investigative journalism”, and “responsible media” projects in countries where the Panama Papers stories have been amplified, such as the Balkans, Ukraine, Mexico, and the Philippines. The Brookings attack on the Panama Papers as a Russian plot appeared on April 7, two days before the State Department made these admissions. The OCCRP reports the US Government and Soros money in the funding section of its website; it omits them both in its history of the organization. As for how accountable the ICIJ is to investigation of its own funds, it isn’t. This is what happened when the ICIJ’s director, Gerard Ryle, was asked questions about a Russian investigation he had just published with the Guardian in November 2012 – before Ryle cut the telephone line.